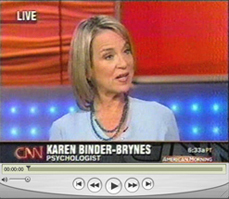 Dr. Karen Binder-Brynes is a leading Psychologist with a private practice in New York City for the past 15 years. Her practice consists of older adolescents and adults. 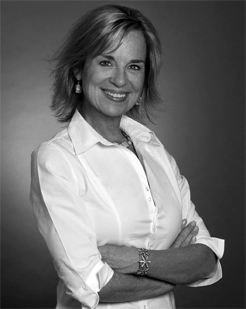 She provides Individual as well as marital, family and group psychotherapy. 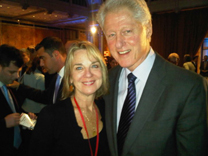 In addition, Dr. Binder-Brynes is a leading expert in the field of posttraumatic stress. Dr. Karen Binder-Brynes has recently been contracted to the Episcopal Church to counsel and debrief returning Military Episcopal Clergy who have been deployed in Iraq. Recently, Dr. Karen Binder-Brynes has become a charter member of the Division of Trauma Psychology of The American Psychological Association and has been appointed to the Committee of Disaster Response. She is currently working on setting up remote video trauma relief counseling programs in conjunction with the Episcopal Church in the New Orleans area. 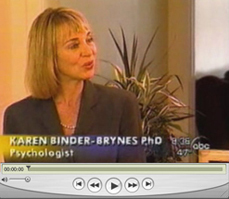 Dr. Karen Binder-Brynes will be answering weekly questions about psychological issues on the new Website "Goop.com". This is a lifestyles website created by Gwenyth Paltrow and launched September, 2008. Dr. Binder-Brynes appeared on ‘The Morning Show with Mike and Juliet” to discuss mid-life crisies in women. Dr. Karen Binder-Brynes addressed the clergy and administration of Virginia Tech. University around post-truama issues which may be affecting returning students. Dr. Binder-Brynes will be again appearing on "Open Court-Court TV. Dr. Binder-Brynes was back down in New Orleans from May 11th-13th at the Soloman Episcopal Center to address the annual Deacons' conference about the long term effects of traumatization. In addition, she is currently spearheading a program which will bring video training and counseling to the New Orlean's area. 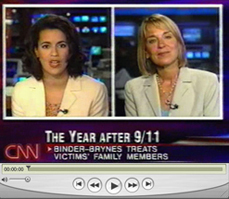 Dr. Binder-Brynes appeared on both the Nancy Grace and CourtTV to discussing the Skakal and the Spector trials. conferencing the clergy from the Virgina Dioseses involved with the recent tragedy at Virginia tech. Dr. Karen Binder-Brynes will be appearing on “Good Morning New York”, Fox Television, on to discuss the traumatized students at Virginia tech. Dr. Binder-Brynes appeared on Fox Television this morning on the “Juliet and Mike” show discussing the traumatic aftermaths of The Virginia Tech. College shootings. Dr. Binder-Brynes will be appearing on Open Court, CourtTV with hosts Lisa Bloom and Vinny Pellatan. Dr. Binder-Brynes will be addressing Episcopal Clergy including returning Military Clergy from the Iraq War at the Trinity Conference Center in West Cornwall, Ct. Dr. Binder-Brynes will be discussing the vicissitudes of traumatization. Dr. Binder-Brynes will be visiting New Orleans to meet with clergy from the devastated 9th Ward to discuss the issues involved in counseling traumatized populations. Coping with the Loss of a Co-Worker to Domestic Violence-Aftermaths. 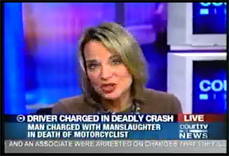 Dr. Karen Binder-Brynes appeared on Court TV, “Open Court” to discuss the Cape Cod “Worthington” Case. Presented by: Dr. Karen Binder-Brynes and Nixa. "Parental Control Issues"-When is too much, too much? Lecturing parents of new students on separation issues for children beginning preschool. Debriefing Masters and Doctoral students upon there return from helping and researching survivors of Hurricane Katrina in New Orleans. Training Master’s and Doctoral students on post traumatic stress and vicarious traumatization who are embarking on a 2 week research and counseling expedition to help and understand survivors of Hurricane Katrina in New Orleans. Site Design by MHCG INC.